The colours of a peacock truly are incredible, the vibrant yet natural tones of emerald green, turquoise, deep green and purples are simply breathtaking. 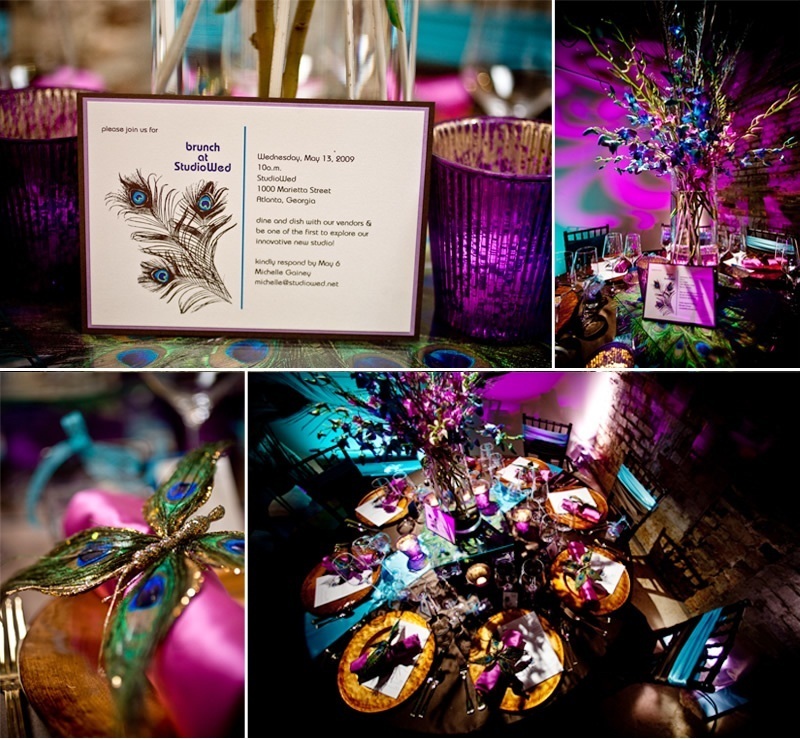 This theme is all about using vibrant colours together and mixing jewel tones so be bold. For a Autumn or Winter wedding keep lighting dim and let the light pick up on the sparkle of the jewel tones. 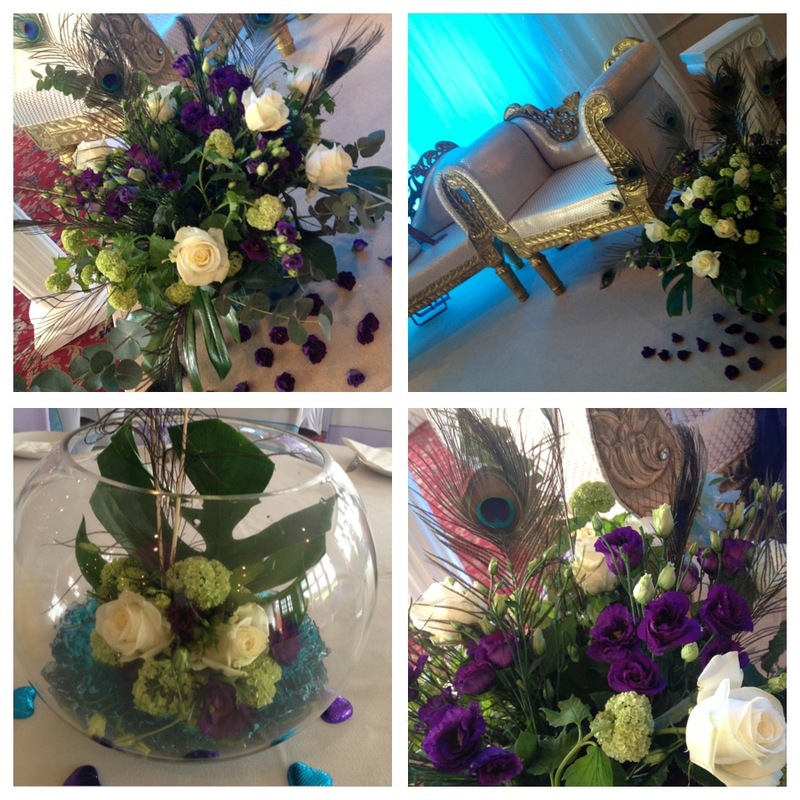 Mix with bronze and metallic shades, the vibrant colours will brighten up a venue that has dark wood. Use the peacock feather as your motif on invitations and table menus, napkins are also a great way to bring in some vibrant peacock shades. Peacock feathers are great as they can be used to decorate almost anything, in your flower arrangements, bouquets or in hair hair pieces and buttonholes. If you love the bold colours and want your theme to really stand out, then opt for coloured table linen instead of white you can see from the pictures that it look fabulous! 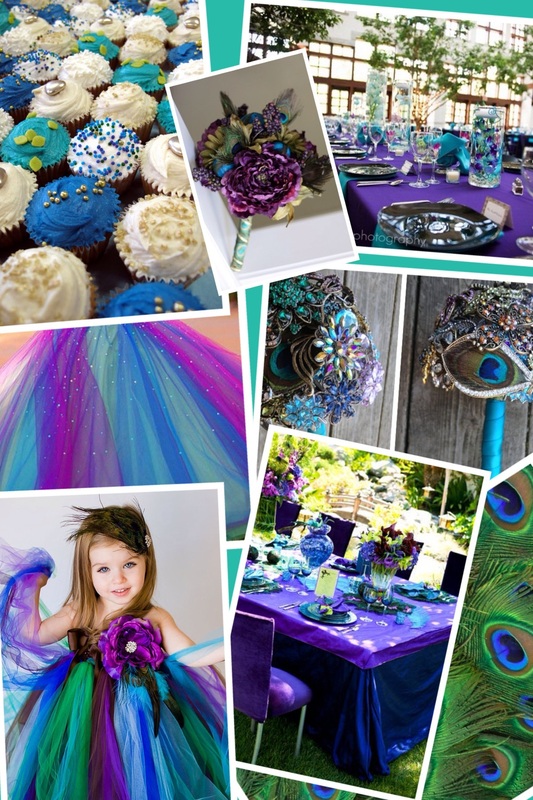 Don’t forget to run the peacock colour theme throughout your decor, even for your cake or cupcakes. Flower girl outfits can also be in purple, emerald green and turquoise, having tutus is a great way to mix all the colours but still look soft. In Winter, there are many flowers in shades of purple and hues of blues you can use for arrangements. If you do want to lighten the theme then adding ivory to the mix still looks lovely, in floral arrangements as well as table linen. Lighting is key for this theme, as you can see it is very easy to create the aqua and blue hues in lighting to make furniture and staging really stand out. 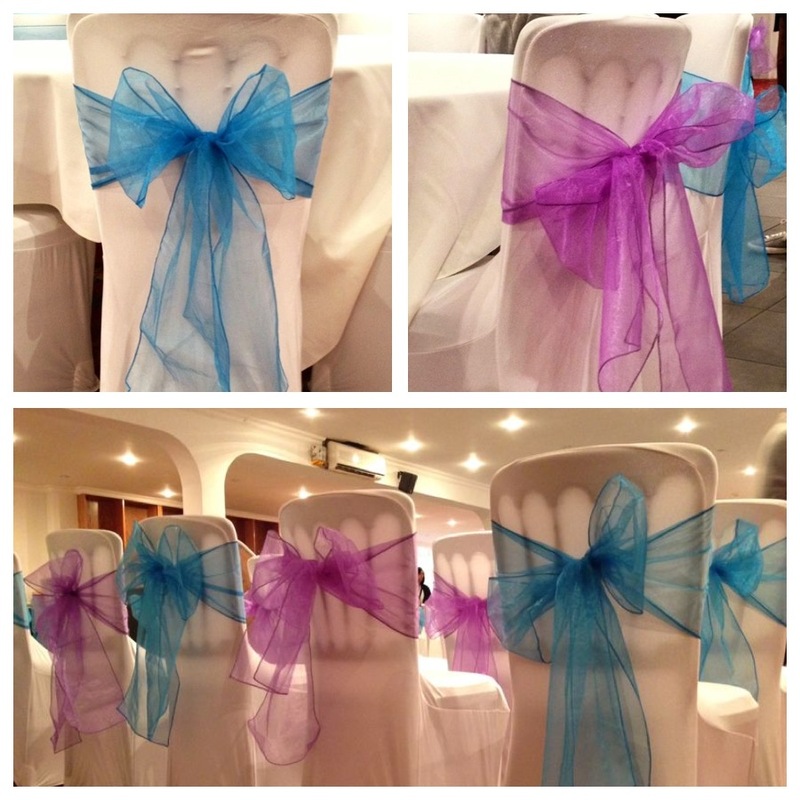 Chair Covers are vital for any theme, they add an instant touch of glamour to any venue and all of a sudden your furniture matches your theme. The great thing about the sashes is that you can use up to three colours (don’t do more than three if less than 100) with a white chair covers your room is instantly brightened but if you want a darker look then just opt for sashes with darker wooden chairs. 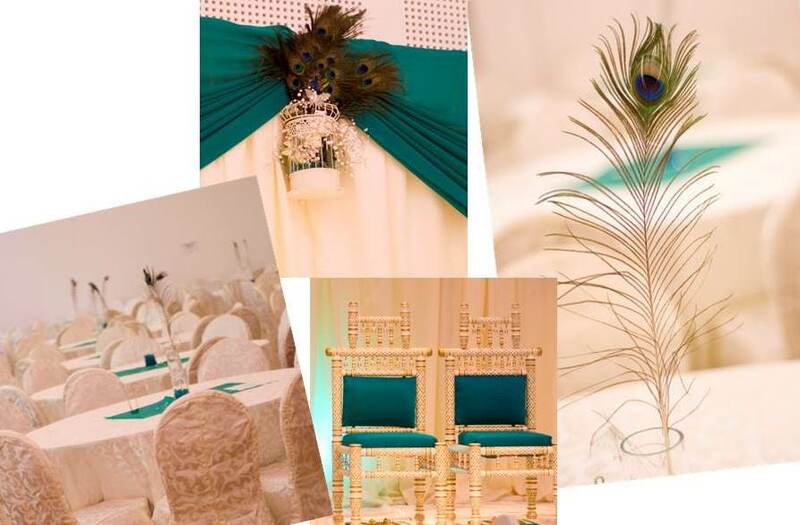 If you want the peacock theme but in a subtle way then ivory with just touches of emerald green makes great scenery for wedding images, letting the peacock feathers themselves take centre stage for your theme. Adding ivory, brightens your venue and is perfect for a summer wedding.